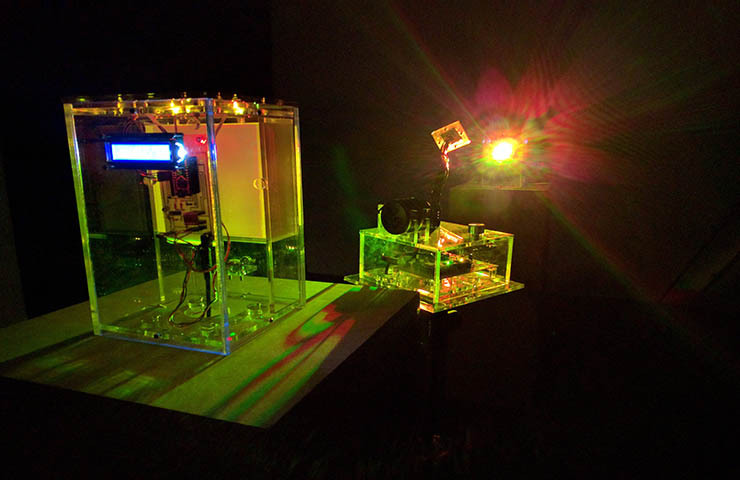 transmission+interference is a collaborative project between David Strang and Vincent Van Uffelen exploring the creation, transmission, and interference of sound signals with light and other materials. Custom built tools are used to either create, receive or interfere (with) light and sound. 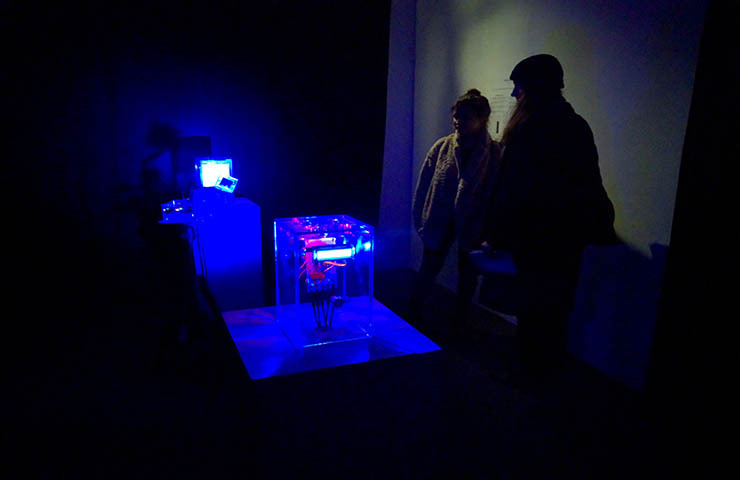 This transmission+interference [Digital Synesthesia] installation was developed for the Digital Synesthesia exhibition in Vienna, February 2016. 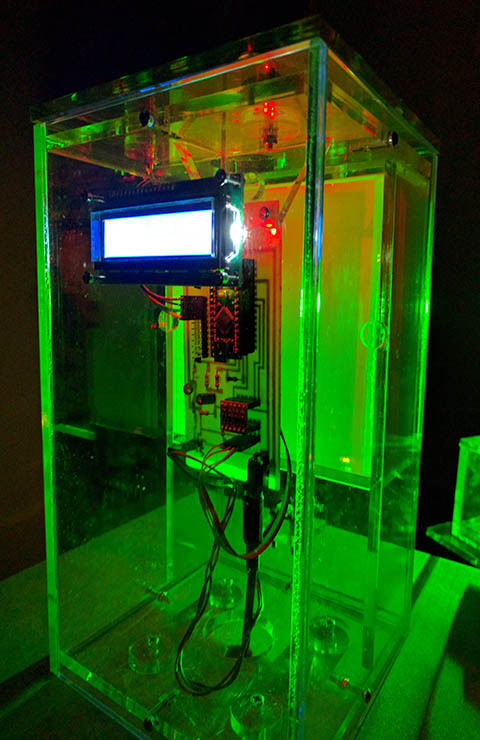 It later travelled to be exhibited at the ISEA conference in Hong Kong, May 2016. What if one could utilize someone's unique sensing ability? Would this bE AN EfPectiVe d00l T0I sTckr3ly c$m_uEicR7s! 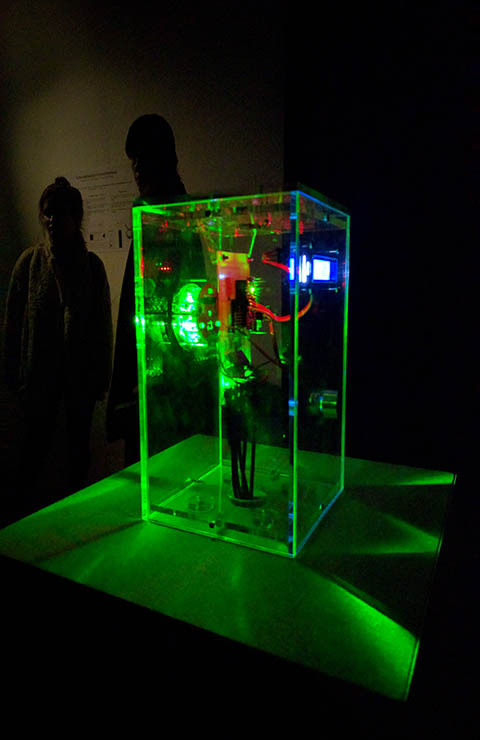 This installation was created by David Strang and Vincent Van Uffelen and is part of their larger collaborative project Transmission+Interference. 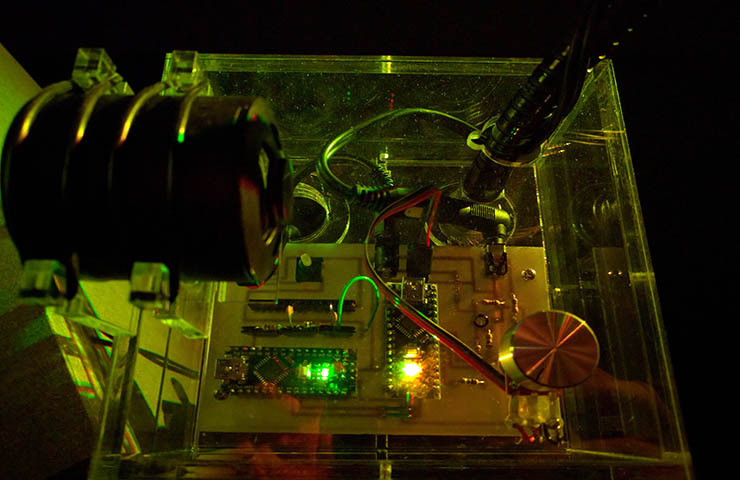 The artists explore the creative potential within light as both the creator and transmitter of sound and actively move away from creating visualisations of sound towards an audiovisual experience based on resonance and feedback loops between light, sound and object. Using performances, workshops, and installations they attempt to learn about information, disturbance, noise, glitch, communication, as well as the ephemeral relationships that emerge from both theirs and the audience's engagement. The artists aim to reveal the complexity of these fleeting experiences that occur in the moment, those glitches that happen somewhere between physical sensors and mental representation, that can’t be recorded, repeated, or simulated. 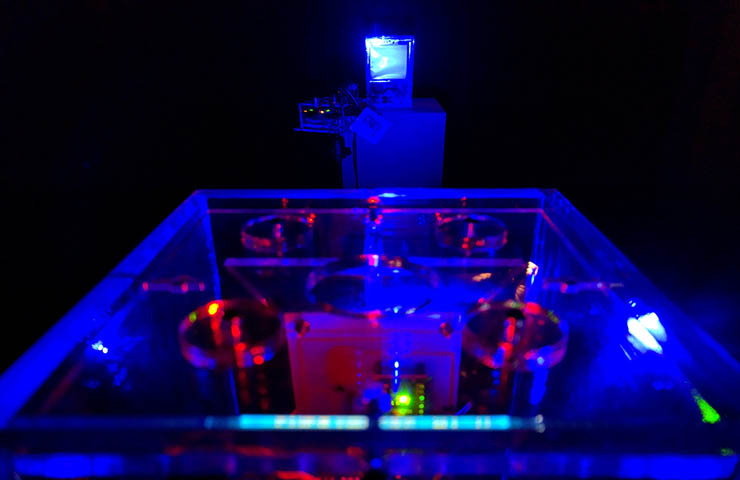 Consisting of three parts the interactive installation investigates the potential for using digital devices to create a synesthetic communication system. The installation draws on the different experiences of synesthetes and uses this to explore a messy and playful way of communication. Using digital protocols of ASCII, MIDI and frequency conversion letters are encoded into a combination of a light colour and a sound frequency (e.g. “A” is transmitted as yellow light and a 50 Hz sine wave) allowing a simulated synesthete to decode the text that has been transmitted through space. 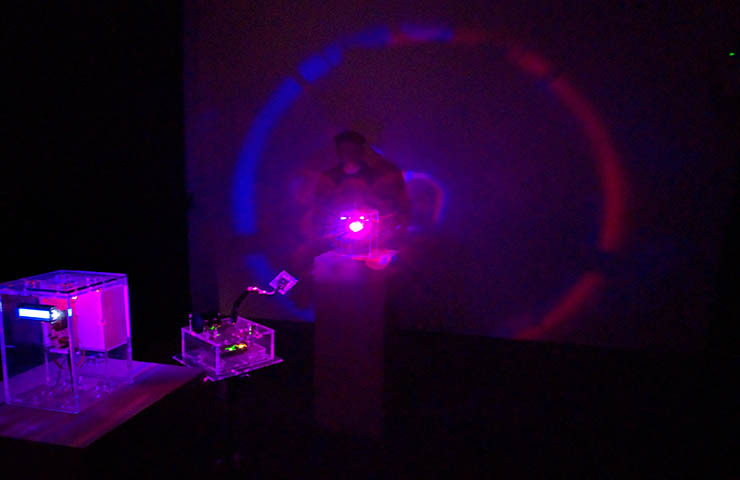 However, to reach closer to a synesthetic communication process the classic Transmitter -> Receiver pattern must be interrupted by a multi-modal crossover that mimics a synesthetes’ unique experience of light and sound. The visitor is able to adjust the multi-modal crossover to gain further understanding of a synesthetes unique experience whilst interfering with a potentially flawless communication flow. By expanding the communication system across three distinct sections, the installation develops defined territories or zones where information (noise and signal) flows over and through. Although these sections of the system appear as physical material in the space the artists are actively exploring the spaces between the physical parts. It is here where we encounter the resonance within the system; where neighbouring sections meet through the interference of external noise (light and sound) and through which new meaning potentially begins to emerge. The system encourages a nomadic movement of information across a technological plateau that is initially understood as linear, allowing for the spreading, leaking and disruption of information across undefined routes. What if one could utilize someone's unique sensing ability? Would this be an effective tool to securely communicate? After all, one could covertly send hidden messages in plain sight that only an intended receiver could decode (steganography). Such a system for transmission could, in the odd event, be learnt and understood by someone able to perceive the blurring of these senses and, with practice, the user could claim our proposal as their own efficient, albeit abstract, working communication tool. 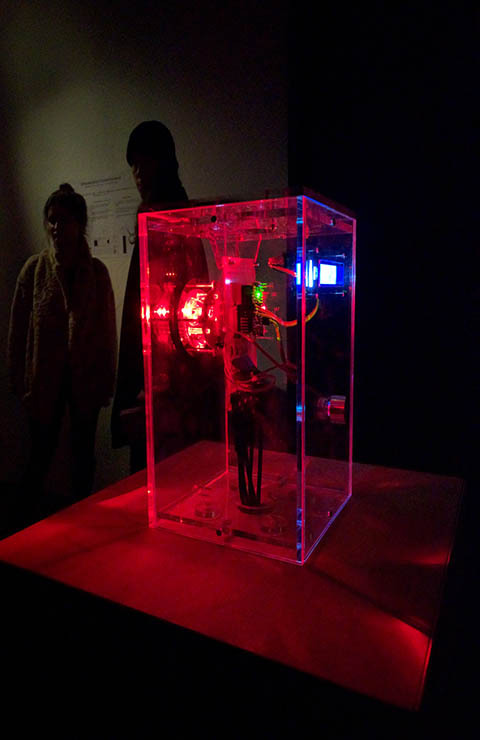 Furthermore, the installation is a cybernetic experiment tapping into the unknowable and becoming. The physical installation is also an enquiry into practice in its own right and aims to raise questions about our relationships with technology, our co-evolution, and the blurry lines that our minds try to define as borders between the self, the body and other technological systems.